I'm a huge fan of the MacBaren HH line but I've not had a chance to try their non-HH offerings. 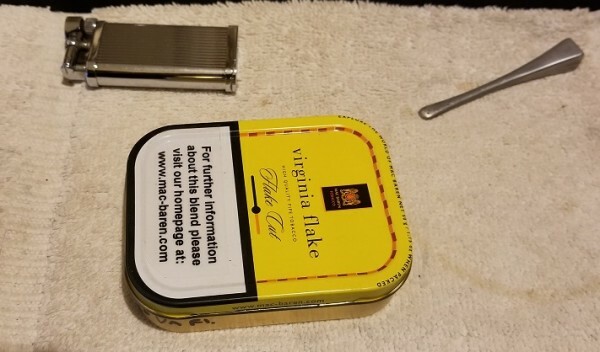 This tin of Virginia Flake is from November 2012. A tidy "square" tin that gave a nice hiss when opened and a pleasant presentation in gold foil. As usual, my sniffer offers few clues from the tin. I get "juicyfruit" gum with a slightly sour/vinegar undertone. Gently prying out a flake, it's barely moist and pliable, screaming, "I'm perfect! Smoke me now!" Who am I to ignore such a command? 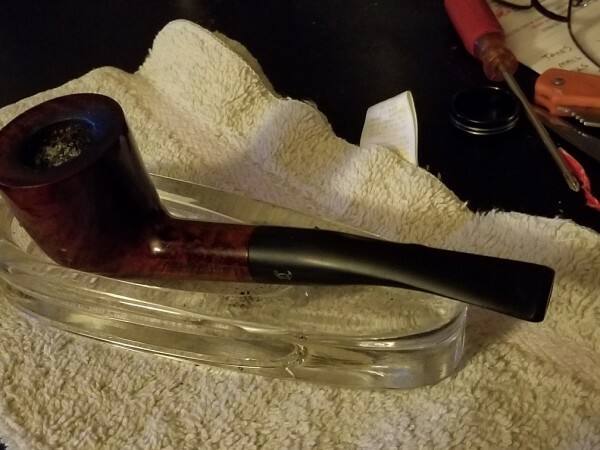 I chose my Viking Classic 1/8 bent Dublin, my most trusted flake burner. I usually use this for ODF and Dark Flake Unscented. Since I've been doing a lot of ribbons lately, the Viking has been dormant for a month or so. I'm actually on my 5th flake as of this review. Each one has been amazing in its flavor, burn characteristics and consistency. I've never had a flake so willing to be smoked. Folding in half long-ways, then in half the other way and inserting with the factory edge down and the rough fold at the top, it's a perfect fit. Just loose enough to allow for expansion and full enough to tamp the top into a uniform lighting surface. Two chars, two tamps and one good true light seems to do the trick. 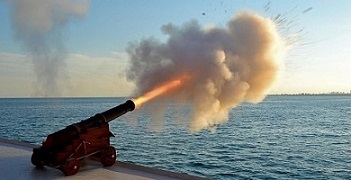 The smoke streams in a machine-like controlled fashion. Not billows, not wisps, but that perfect middle ground. A natural Virginia sweetness dominates, subtle "mid range" tones. No lemons, little orange reaching towards slightly candied, or maybe distant cherry. A wee touch of bready grassiness hides in the background, almost unnoticed. Supposedly there is a topping. If so, age has subdued it beyond my comprehension. I just get a fine, smooth VA experience. Many would call it uninspired, unexciting or one dimensional. I shed a small tear for those who don't get to appreciate the subtleties of these demure offerings. With some focus, you may get through the load with one relight. As I pause to think and type, Ive had two touch up lights and one mid-way ash dump. It's quite easy to reach the last quarter of the bowl without the briar getting warm. In this conical Dublin, the heat, flavor and moisture begin to build towards the end. I'm accustomed to this exact pattern from this pipe. A quick pass of the pipe cleaner, chisel the harder bits from the walls to the center, tamp and touch up, then off to the finish line. Not a nic bomb, but noticeable by the end. Room note is a mild, but unapologetic tobacco sort. The "bread" thing, which eluded me for my first year, grows a bit more noticeable near the end. A tangy tongue reaction grows during this phase. A tad whiff of ammonia, which I always seem to get from my best flake experiences. My average time is just under 90 minutes. 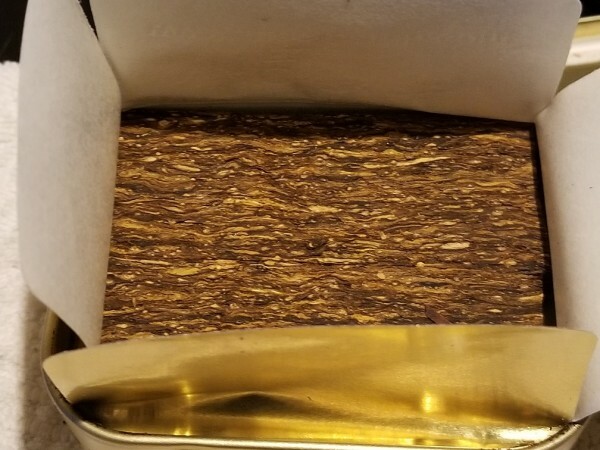 This is one of the smokes that I seem to push my luck near the end, risking a bit of ashiness to get the nice, concentrated flavors near the end. Set your own threshold accordingly. If you need a busy flavor bomb, this may not be the one for you. If you like VA flakes and can appreciate them for what they are, you may find a treat here. Do keep in mind that there are 7 years on this tin. I've not had it fresh and can't offer any insight into the differences at this time. I've already ordered a couple of tins that I hope to "forget" about for a few years. A very good review there, man. I do have experience with this blend fresh, and I mostly certainly recommend aging it first. Fresh, it's more acidic and fast puffing will get you a little bite. Time settles it down. Great review! That one was on my must try list. Now it's on the illustrious REALLY must try list. Good review! You tempt me to add some to my already overstuffed cellar. If you like this one, you should try their Virginia #1. Great review Sir, although, I must confess,in the past,this and particularly Virginia nro 1 did not seem to agree with my tongue. 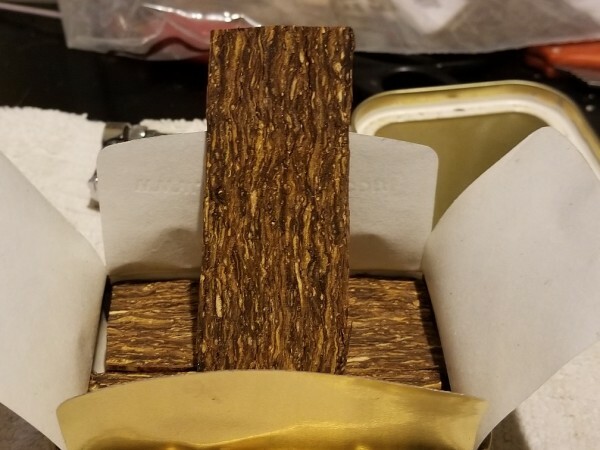 I like the Flake a lot more than the virginia#1, I don't find a ton of similarity in flavor, flake is much "brighter" to me - too bright in a fresh tin, it is indeed a little snippy. But 3 years in the tin and magic happens, and it comes out smooth and sweet. Easy stuff to like if you are a low-n-slow puffer. I’m also working on a 2012 tin. To me it tastes like tea with just a touch of honey. What I remember as a borderline annoying zestiness when fresh has mellowed to a very pleasant persistent spice note to go along with that touch of honey. Great stuff, and a blend rarely discussed it seems. I did the same as you and bought a bunch more to enjoy in a few years.